Slaves should be run with the --log-bin option, and if not using GTIDs then they should also be run without --log-slave-updates. In this way, the slave is ready to become a master without restarting the slave mysqld. Assume that you have the structure shown in Figure 16.4, “Redundancy Using Replication, Initial Structure”. 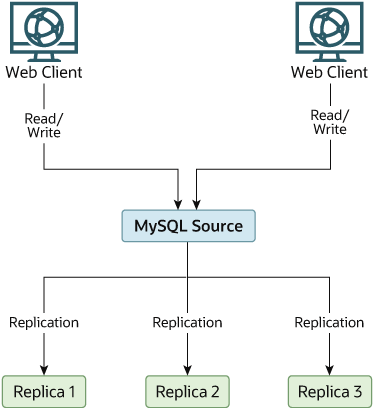 In this diagram, the MySQL Master holds the master database, the MySQL Slave hosts are replication slaves, and the Web Client machines are issuing database reads and writes. Web clients that issue only reads (and would normally be connected to the slaves) are not shown, as they do not need to switch to a new server in the event of failure. For a more detailed example of a read/write scale-out replication structure, see Section 16.3.4, “Using Replication for Scale-Out”. 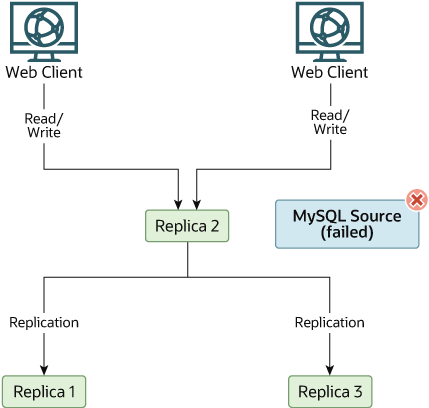 The resulting server structure is shown in Figure 16.5, “Redundancy Using Replication, After Master Failure”.